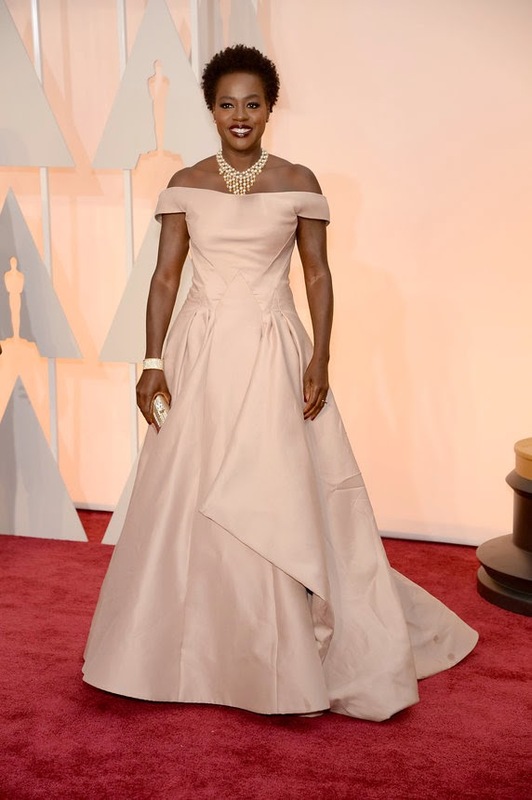 The Sandman Chronicles: Oscars 2015 - who won for best dressed? Oscars 2015 - who won for best dressed? The awards season always culminates in the Oscar ceremony, so the ladies keep their best bets for impressive (or disastrous) appearances for this night. Who wore whom has managed to upstage who won what, and with the choices the Academy makes each year, deservedly so. Let's check some of the best dressed ladies on the 87th Academy Awards red carpet (all photos courtesy of wwd.com and Donato Sardella, and Getty Images). Cate Blanchett is the undisputed Queen of Hollywood. She probably surprised most of the nominated for Best Actress ladies in picking a simpler dress to wear (Galliano for Margiela, a first for Oscars) - you can see it in the outfits they picked, thinking of how to upstage Cate who would be giving them the award. Tough luck ladies. Cate is never upstaged. The necklace is a one of a kind piece from Tiffany's in their signature colour. It doesn't get more regal than this. Lupita Nyong'o is resplendent in a custom made Calvin Klein dress covered with 6000 pearls. She's becoming the heir to Cates' throne. Margot Robbie wore a laid back Saint Laurent dress with a 30s Van Cleef and Arpels necklace that suited the plunging neckline so good. I think if she had piled some big hammered gold cuff bracelets on it would have looked even better - next time check Loulou De La Falaise on how to wear YSL. Thankfully Rosamund Pike did not disappoint - I was afraid it would be yet another disaster like some of her recent appearances. But she rose to the occasion with this magnificent Givenchy Couture. One of the rare occasions that red looks good on the red carpet. When I read that Emma Stone, one of my favourites, would be wearing Elie Saab, I flinched. I do not like most, if not all, the clothes Saab makes, so it looked as a disaster in the making. Fortunately it wasn't. My only objection is the light shade of green - she would have looked so much better in a darker one. Marion Cotillard picked an unusual shape (at the back at least) for the red carpet - and it was a breath of fresh air. I love the texture of the (lasre cut?) fabric and she looks great in it. So beautiful and French. Dior Haute Couture. Scarlett Johansson is the embodiment of "whoa" here. I love her short hair (although it looked as if she skipped the hairdresser this time) and the shade and shape of the dress suits her to a T. Versace Atelier with Piaget necklace. Sophie Hunter looks gorgeous in this red Lanvin - another proof that red can look great on the red carpet as long as you have an amazing dress. Cumberbatch accessory optional. I love Patricia Arquette and she always looks great on the red carpet. Simple, elegant, real. She's wearing Rosetta Getty who designed this especially for her. How stunning can Viola Davis look? Very. Even though a stronger colour would have suited her better (a violet? ), she nails it once again. Zac Posen should research some fabrics that do not crinkle that easily. Naomi Watts (Naomi fookin Watts) got some flack for this Armani Prive gown, but I really like it. Texture, metallics, cut, all work well on her. Tegan and Sara, nominated for best song for the Lego movie, stayed true to themselves and their style. And won hands down. Tegan is wearing a The Kooples suit and Barbara Bui shoes, while Sara is in a Public School dress. Everything is awesome indeed.